Frank Grzeszczak at International Yacht Collection's having a good month as he tells me he's just sold the 37.5m motor yacht Ocean Drive. Delivered by Palmer Johnson in 2009, this superyacht features an exterior and interior design by Nuvolari Lenard sleeping eight guests with quarters for eight crew. 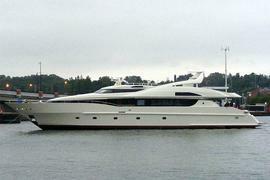 Twin 2735hp MTU engines and a planing hull give Ocean Drive a top speed of 24 knots and she was asking $17.5 million.